glasseyedave	. The Gospel the church refuses to believe	. Arminianism, Calvinism, eternal security, holiness, Perseverance of the saints, Repentance, rightouseness, The gospel according to the gospel, The Gospel the church refuses to believe, Wages of sin is death, What did Paul mean by the wages of sin is death?, What gospel did Paul preach? 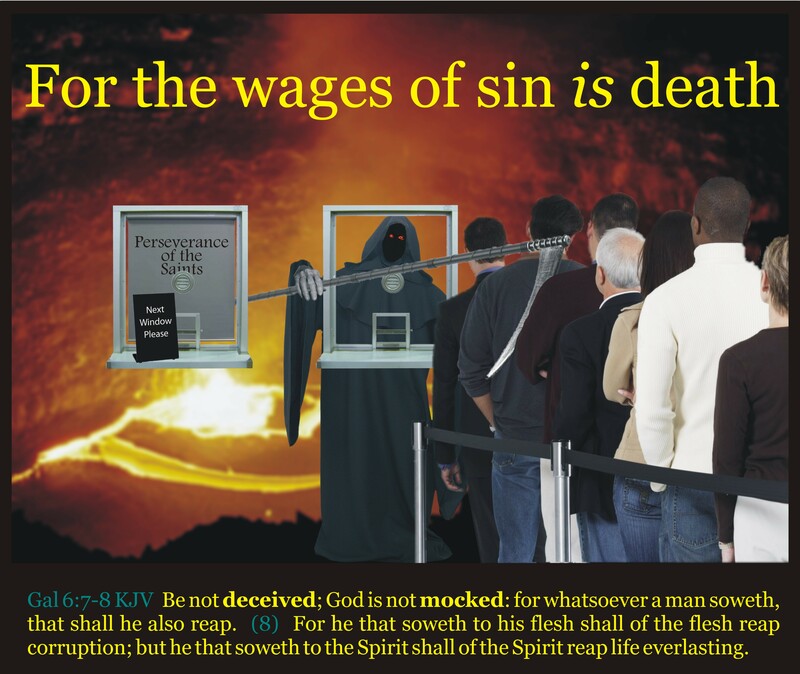 Almost every Christian can quote the first part of Romans 6:23, “For the wages of sin is death…”. But what do we think when we quote Paul? Do we think that the wages of sin is death no matter what! Or is the wages of sin death only for the unbeliever, but Christians get a pass from Jesus when we sin. There is a doctrine in the church which teaches that Christians can sin for an undetermined amount of time doing an undetermined amount of sinning and the wages of sin is not death. This doctrine, to be more specific, says this sinning believer will not ever be in the danger of going to hell and certainly not result in spiritual death. So to repeat the question, is the wages of sin still death, or not? glasseyedave	. The Gospel the church refuses to believe	. Arminianism, Calvinism, Did grace start at the cross?, Gospel, Grace, How does God impute His people righteousness?, imputed righteousness, salvation, The gospel according to the gospel, The Gospel the church refuses to believe, When did grace start?, Where is grace first mentioned in the Bible?, Why does scripture say we are children of Abraham? A reader by the avatar Las Artes left me a comment on my post The Church of the Living Dead. Please go there and view the entire comment. glasseyedave	. contradictions in scripture?	. Arminianism, Calvinism, Does James and Paul disagree?, False teachings found in the Church, Fruit of the Spirit, Gospel, Grace, salvation, Spirit filled, Ten Commandments, The gospel according to the gospel, The Gospel the church refuses to believe, What does it mean to live in the Spirit?, What does the Spirit do for a believer? For far tooooooo long the Christian faith has been putting all of its fruit in one basket. We have been mixing fruit that does no good for the soul with fruit that can see a man unto eternal life. We have been mixing rotten fruit with good fruit. Unfortunately, pastors are taught in seminary that all fruit mentioned in the Bible is the same kind of fruit and they mistakenly use them synonymously. Pastors lead their congregations into accepting both the bad fruit and the good fruit as evidence of a faith in a believer’s life. They then preach about both kinds of fruit and tell their congregation to live by them both. But this is not what scripture tells us to do. glasseyedave	. The Gospel the church refuses to believe	. 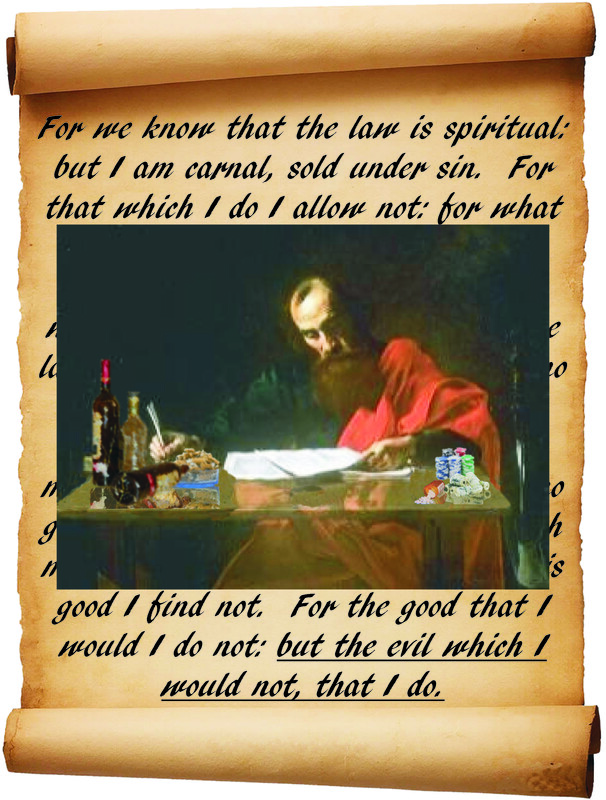 Are Christians to follow the Ten Commandments?, Arminianism, born again, Calvinism, Gospel, Grace, holiness, Ten Commandments, The gospel according to the gospel, The Gospel the church refuses to believe, What role does the Law play in a believers life?, Who is Melchisedec?, why is Jesus compared to Melchisedec? Once people leave the Wide Path that leads to destruction and choose to follow Christ, putting themselves on the Narrow Path, what is the standard that believers should live their lives by? Are we as Christians supposed to become followers of the Torah? Is the Old Testament Law now a requirement for the believer to obey? Many Christians today have a biblical basis from scripture to say the ordinances found in the Old Testament are no longer required of God’s people. We do not sacrifice animals, nor do we observe many other ordinances in the Torah. 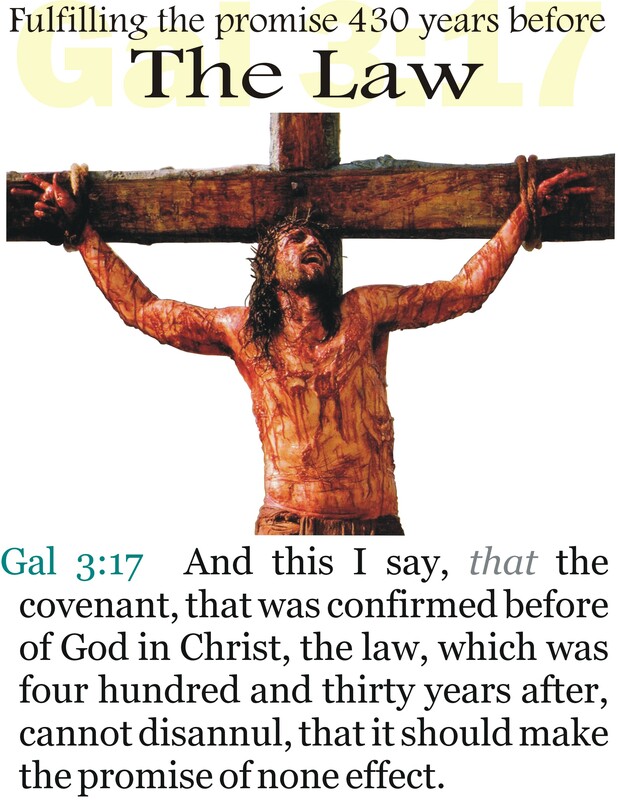 Some will argue that even though we do not have to obey the ‘Sacrificial Law’ we have to obey the ‘Moral Law’ or the moral code of the Old Testament. But is this true? Many will argue that we need to continue to follow the ‘Moral Law’ found in the Torah, after all God doesn’t want us to murder… does He? Of course the correct answer is no, God does not want us to comment murder. In fact God doesn’t want us to violate any of the ‘Moral Law’ found in the Old Testament. But if God doesn’t want us to violate this law, are we then bound to live under the influence of the Ten Commandments? What if scripture actually teaches that those who preach this understanding of the gospel have actually left the gospel? What if keeping the Ten Commandments is exactly the opposite of what the hope is for the new believer? glasseyedave	. The Gospel	. Apostle Paul, Arminianism, Calvinism, Church Doctine, faith, Grace, imputed righteousness, New Testament, The Book of Galatians, The gospel according to the gospel, The Gospel the church refuses to believe, What did Paul teach? How to cook THE BOOK! Here at The Gospel According to the Gospel it is no secret that I contend for a gospel that some are surprised to find in scripture. 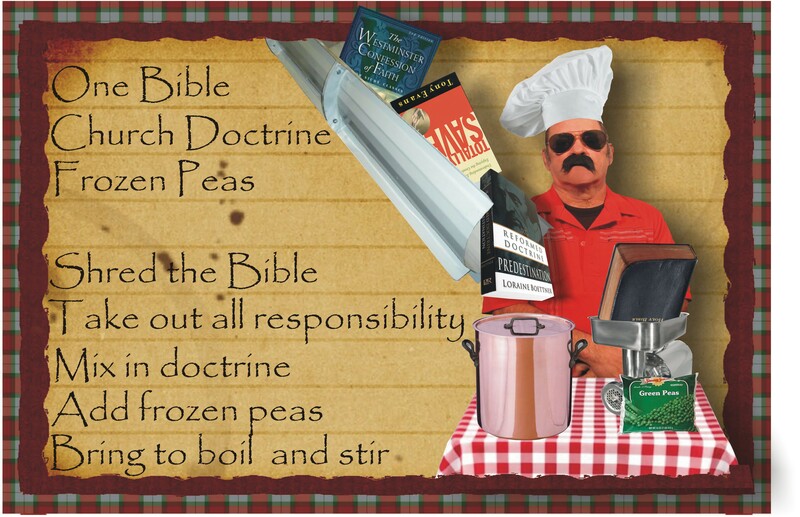 Which of course contradicts a lot of doctrine. Hence the nice graphic I made. It is also no secret that many don’t agree with me because of their indoctrination and many more are still trying to grasp what I am contending for in the gospel. Sadly, short post here and there is not a very effective way to communicate the gospel I see clearly laid out in scripture. But there is a way for those interested to get a really good feel and sense of what I am contending the gospel is. I have 21 radio programs that are 25 minutes long uploaded to my blog. They are located under the ‘Radio‘ tab. I am challenging people to take 25 minutes a day to listen to what I am contending for in the gospel.